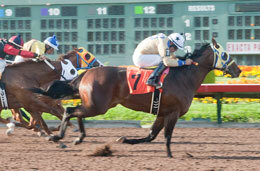 Zoomilicious, under jockey Roberto Hernandez, setting the fastest qualifying time for the $261,200 Kindergarten Futurity(G2) at Los Alamitos Race Course. LOS ALAMITOS, CA�MAY 4, 2014�A pair of IVORY JAMES fillies qualified to the Grade 2 Kindergarten Futurity at Los Alamitos Race Course Sunday night, including getting the fastest qualifying time from 57 starters. The 10 fastest qualifiers, from eight trials races contested, will return to the Orange County oval on Sunday, May 18 and vie for the winner's share of a $261,200 purse over 300 yards. Jockey Roberto Hernandez rode Zoomilicious to a three-quarter length win in the first trial (Race 2) to set the top qualifying mark of :15.403 seconds, a 92 speed index. Jamie Gomez conditions the IVORY JAMES filly for owner Jose Ubario. Bred in Texas by Bobby D. Cox, the brown miss was repurchased by Cox at the 2013 Heritage Place September Yearling Sale for $16,000. From the first crop by G2 placed Azoomin With Jessie ($31,255), by Azoom, she is 1-1-0 after two career starts and has earned $3,685. The second dam is the G1 winner and producer Jess Genuine ($195,175), by Mr Jess Perry. Making her career debut, Vitali recovered gamely after getting bumped twice to finish second and earn the 9th qualifying spot with a :15.509 clocking. Trainer Cody Joiner conditions the Oklahoma-bred IVORY JAMES filly for Armando Arreola, Jr. Mackie Racing, LLC bred the $44,000 Ruidoso Yearling Sale graduate from the Mr Eye Opener champion mare Mongoose Jet Eye ($447,550). Vitali is a half-sister to multiple stakes winner Madresita ($85,294), G1-placaed Pajarita Sita ($160,521) and stakes-placed Steal Away, etc. Raul Valenzuela had the riding assignment. IVORY JAMES was the only Kindergarten Futurity sire with multiple qualifiers.